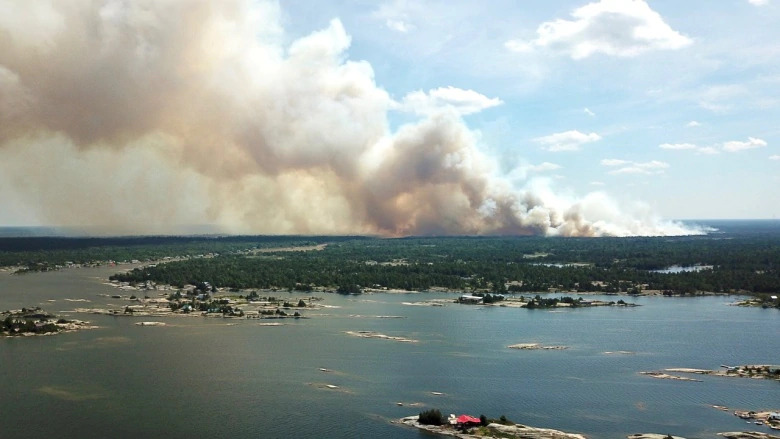 An extensive fire in the Perry Sound area of Georgian Bay, Ontario (Parry Sound 33 fire) has grown to over 11,000 hectare (27,000 acres) as of 8/3/2018 and has caused the closing of the Small Craft Route north of Britt/Byng Inlet. Boaters must travel outside of the restriced area beween Byng Inlet and Beaverstone Bay outside the Bustards. Also there is no fuel available between Killarney and Byng Inlet. Please refer to Harbor Reports for Byng Inlet to the Bustards .and Bad River to Killarney. Permalink Submitted by dspencer on Fri, 08/03/2018 - 17:30. An updated Notice to Shipping was posted yesterday. NORTH END - THE MINISTRY OF NATURAL RESOURCES AND FORESTRY ADVISES THAT ALL USE OF THE FRENCH RIVER AND PICKEREL RIVER (WEST AND EAST OF HWY 69/400), HENVEY INLET, KEY RIVER BASIN, AND ALL ASSOCIATED TRIBUTARIES THAT ACCESS THESE RIVER SYSTEMS, INCLUDING ALL ACCESS FROM GEORGIAN BAY, AND ALL ISLANDS AND WATERS ON GEORGIAN BAY WITHIN THE FRENCH RIVER PROVINCIAL PARK BOUNDARIES, INCLUDING THE BUSTARD ISLANDS, DOKIS ISLAND SYSTEM, PUDDICK ISLAND AND ALL ISLANDS NORTH OF AND INCLUDING SANDY BAY NEAR SHORE IS PROHIBITED DUE TO FOREST FIRES IN THE AREA. Permalink Submitted by dspencer on Thu, 07/26/2018 - 17:51. THE MINISTRY OF NATURAL RESOURCES AND FORESTRY ADVISES THAT ALL USE OF THE FRENCH RIVER WATERWAY, PICKEREL RIVER (WEST OF HWY 69/400), HENVEY INLET, KEY RIVER BASIN, AND ALL ASSOCIATED TRIBUTARIES THAT ACCESS THESE RIVER SYSTEMS, INCLUDING ALL ACCESS FROM GEORGIAN BAY, AND ALL ISLANDS ON GEORGIAN BAY WITHIN THE FRENCH RIVER PROVINCIAL PARK BOUNDARIES, DOKIS ISLAND SYSTEM, PUDDICK ISLAND AND ALL ISLANDS NORTH OF HENVEY INLET NEAR SHORE IS PROHIBITED DUE TO FOREST FIRES IN THE AREA.